The clean economy in the Chicago region and Cook County is performing better than the national average, according to a new report by the University of Illinois at Chicago. That means there’s room for job growth. The report, “Sizing Up Our Region’s Green Economy,” was published this month by the Economic Development Administration University Center at UIC. 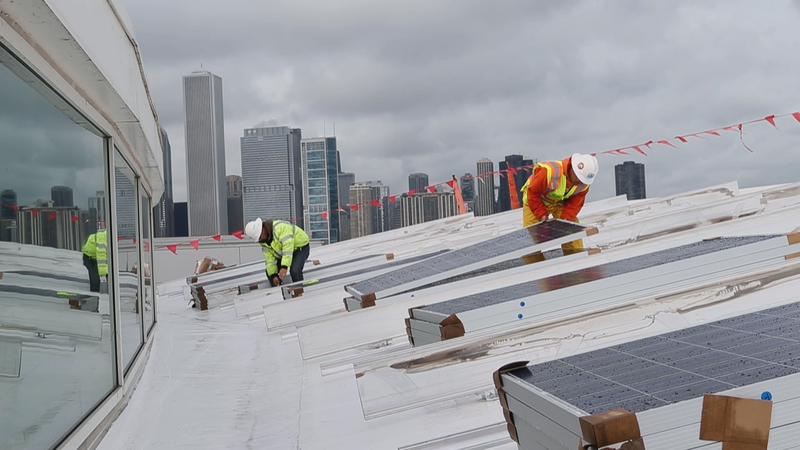 The center is part of a five-year initiative to help the university stimulate and develop Chicago’s green economy, particularly in Calumet and south Cook County. Examples of clean economy include growing, selling and distributing organic food; producing batteries for electric or hybrid cars; or green architecture and construction services. “We’re trying to look at all those products—things that are produced in the economy and industry, manufacturing, etc.—that are clean in terms of their production process, but also green in terms of what they are,” said Janet Smith, the report’s principal investigator. The report jumped off of prior findings on the topic, namely the Brookings Institution assessment on national and regional green jobs. The report, published in 2011, found Chicago doing very well in comparison to other U.S. cities, but Smith said she and the center wanted an update on how the city and local region were fairing post-recession. “I was surprised to see how well we were doing, relatively speaking, because we were speaking about how much Chicago’s economy wasn’t growing that much,” said Smith, who is co-director of the Nathalie P. Voorhees Center for Neighborhood and Community Development and an associate professor of Urban Planning and Policy at UIC. The new report also found clean economy jobs pay higher wages than other jobs, both regionally and nationally. That, in combination with a growing market, makes for some new developments, Smith said. “This is exciting because it shows that there are high-paying jobs to get into, and if it’s growing, then there’s opportunity,” Smith said. But there’s a flip side, she said. On the show: Smith joins host Phil Ponce on Wednesday to discuss the clean economy. May 15: Tweaking Illinois' landmark energy bill would trigger more than $2 billion in wind farm construction, a state senator says. April 10: Mayor Rahm Emanuel announced Sunday a commitment to transition the city’s municipal buildings and operations to 100 percent clean and renewable energy by 2025. March 1: Chicago is offering grant funding to cover up to 30 percent of equipment and installation costs for new direct current fast-charging stations, which can charge electric vehicles in 20 to 30 minutes.